Are you working 20 hours a day? Do you know anybody that works those kinds of hours? 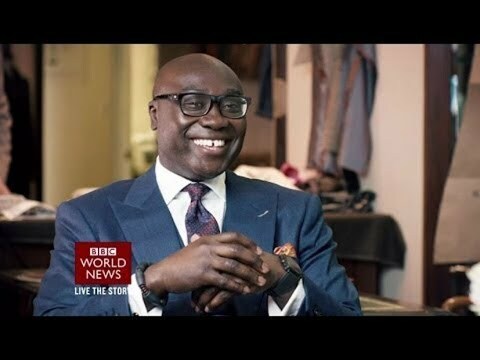 Tributes have continued to pour in from around the world following the death of BBC World News Broadcaster - Komla Afeke Dumor who passed away last Saturday following a Cardiac arrest at the age of 41. Ghana's President John Mahama described him as one of Ghana's "finest ambassadors" and "a broadcaster of exceptional quality and Ghana's gift to the world." Nelson Mandela's daughter, Makaziwe, described him as a "shining star of Africa," while BBC's global News Director - Peter Horrocks, described him as "a leading light of African journalism - committed to telling the story of Africa as it really is." BBC Radio 4 Today presenter Mishal Husain described him as "one of our brightest and best. ... Komla developed his own unique on air style, seamlessly moved between TV and radio and influenced Africa coverage across the BBC." Komla Dumor was born in Accra on October 3 1972 to Ernest Dumor - a Professor of Sociology and the late Cecelia Dumor who graduated with a Master's degree in Mass Communication. He had enrolled in 1988 to study medicine at the University of Jos, Nigeria but left for Ghana where he graduated from the University of Ghana with a BSc in Sociology and Psychology; and later obtained a MA in Public Administration from Harvard University. His entry into journalism may be described as accidental. During a strike at the University of Ghana in 1998, he saw a job advert for a traffic news reporter at Joy FM station and thought he would give it a go to earn some extra money. In 2000, he became the morning show host for Joy FM in Accra, Ghana, and was the 2003 winner of Journalist of the Year award given by the Ghana Journalists Association. He joined the BBC African Service in 2006 as host of the radio programme Network Africa. From 2008 to 2012, he presented The World Today on the BBC World Service. In 2011 Dumor began presenting the World News and Africa Business Report on BBC World News television. At the end of last year, he was named by New African magazine as one of the 100 most influential Africans of the year 2013. In 2001, Komla married Kwansema, a lawyer. They were blessed with three children: daughter Elinam Makafui (God has always been there for me, Praise him), aged 11; son Elorm Efadzinam (God loves me, he comforts my heart), 8; and daughter Emefa Araba (I am at peace), 2. His grandfather, Philip Gbeho, was a renowned musician who composed Ghana's national anthem following independence from the United Kingdom in 1957. How are the Mighty Fallen! May Almighty forgive and let him have Eternal Rest. May Almighty God console Africa as a whole not Ghana alone because he was an inspiration to all African.